Dear Sir Peter, I wrote the previous comment, but did not see your last comment. I want to fix this. The question of the authenticity of the remains of Emperor Nicholas II and members of his family is a political issue, but not a historical one. The place where the Bolsheviks hid the bodies of the murdered Imperial Family is a deaf forest. Where could the corpses of another family come from? This again is some kind of "conspiracy theory". Genetic analysis has confirmed that these remains are genuine. His Serene Prince Kulikowski-Romanoff, being as the closest relative of blood, gave his biological for comparison. Authenticity is beyond doubt. But there is undoubtedly another. Modern Russia is a difficult country, in the 1990s there was a struggle for power between different groups of the former communist nomenclature. Always for opponents any scandal is important to expose their opponents as "liars". The story of the remains of the Emperor had a great international resonance, first of all, for the relatives of Emperor Nicholas, that is, for the British Royal House. If the opponents of Boris Yeltsin argued that "the remains are fake," they quarreled with Boris Yeltsin with Her Majesty Queen Elizabeth, that's all. But it was not possible. True, the echoes of this intrigue can still be heard. Therefore, I say that this is a political issue, but not a historical one. Dear friend, thank you for this video. Unfortunately, English is not my native language for me. I listened to this interview of Sutton's profession, and I did not understand everything. I did not understand which book is specific, about which you are talking. Probably, this is the book "Wall Street and the Bolshevik Revolution," is not it? I am familiar with this book, it is translated into Russian, it is in my library. I am not a supporter of the "conspiracy theory" and I look at the version about the "ritual murder" of Emperor Nicholas II very skeptic. In the early 1990s, when some archives were opened in Russia (not all archives! ), There was a lot of talk about "ritual murder" and a lot of cheap speculation. It was special: the Communists had to go away from responsibility for all crimes in Russia. And the Communist Party, through its secret KGB police, spread this rumor, as if "the Jews ritually killed the Tsar." The Communists had to blame the crime for someone else - for example, on Jews. Yes, we know that some people who were involved in the murder of the Emperor (Jurowski, Vojkoff, Goloshchekin) were Jewish people; but there were also Latvian people, and Russian people, and Chinese people. After all, this does not mean that the Emperor's murder was like a "Latvian ritual," or "Russian ritual," or "Chinese ritual," is not it? The well-known fact that Pinhos Voikoff, when he came to the basement of the house of Ipatiev, where the Tsar was killed, wrote on the wall with a pencil a line from Heine: "That night, until the sun rose, the slaves killed the Tsar." Voykoff also painted four Greek letters on the wall. Based on this, in Russia, and then all over the world, they started talking about "ritual murder." In fact, it was no "ritual murder"; it was just a crime of the Bolsheviks, a terrible crime of the Bolsheviks. This was the punishment of the plebeians over the Emperor, it was a criminal offense. It was criminal, but not mystical. An interesting fact: me and many others know that the Soviet leader Leonid Brezhnev was very bad about killing the Emperor and his family. He never spoke about it publicly, but among his agents Brezhnev said that this was a terrible crime, that the Bolsheviks tarnished themselves with the innocent blood of the murdered children, that this crime would still be bad for the Communists. There is information that it was Brezhnev who was in charge of creating a secret group: this secret group had to find the remains of the Emperor, the Empress, Prince Alex and the princesses, get them out of the earth, and deliver them to Moscow. Paotom Brezhnev wanted a secret burial in one of the Imperial tombs in the Cathedral of Peter and Paul, or the secret transfer of these remains to London, at the disposal of the Royal Family of Great Britain. Such information is, but it has not been confirmed by anything yet. Dear Friend. Thanks kindly for your comments. regarding the "ritual Murder" of the Imperial family- this does not come from me- This comes from General Diterikhs who was directly in charge of the Investigation into the murders, conducted by the White forces in 1918. I have no idea what the reason was, or whether the murders were ritual acts or not. Nikolai Sokolov, who was the judge/ legal officer in charge of the investigation, wrote in 1923/4 that the order to kill the Imperial family came from Jacob Schiff in New York, not the Bolsheviks in Moscow. Jacob Schiff was one of the principle sponsors of the Bolsheviks. The order was given to prevent the Imperial Family being rescued by the Whites who were about to take Ekaterinburg. Such a rescue could have changed the outcome of the civil war. Others say that the order came directly from Lenin in Moscow. I am no authority on these matters. One thing I stand by is that the plan to remove the Romanov dynasty was hatched long before WW1, and the war was necessary to destabilize the dynasty and bring it down. Nicholas II was warned in writing by TWO government officials in the weeks before the outbreak of war, that the war against Germany would be used by the Emperor's enemies to topple the dynasty. All of this is in the Soviet Archives. There was absolutely no need for a war between Germany and Russia, and neither the Emperor nor his troops wanted this war which is why there were so many desertions during the war. There is no one who can convince me that this whole tragic episode was not a conspiracy. There were a lot of people who stood to gain by from the destruction of the Russian Empire. Lenin and Trotsky both maintained bank accounts in Switzerland. Most of the wealth looted from Russians ended up in either Switzerland or New York. Marxism and Communism are a scam used to loot other people's countries and destroy societies- nothing less than that. Workers and peasants in Imperial Russia had more rights than they ever had under the Bolsheviks- who executed workers and peasants en masse as "enemies of the revolution". This is the truth whether some people want to believe it or not. The Russian economy was completely destroyed in just five years- and who benefited ? the Americans, and Europeans who supplied arms, cars, planes, expertise, and other money making opportunities. Like I said before , war and revolution is ALL about money and power. Wealthy Americans were funding Hitler while American troops were being killed by Germans on the slaughter fields of Europe. Wealthy Jews also funded Hitler. The Grand Duke Kirill and his wife Grand Duchess Viktoria Feodorovna were enthusiastic supporters of Hitler- they hoped he would topple Stalin and install them on the Throne of Russia. They also helped to finance the Nazi party. 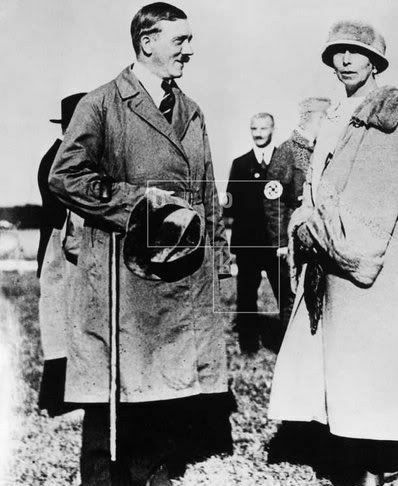 See the photograph below of Grand Duchess Viktoria with Hitler in 1926. My dear friend, I know this photo. Moreover: for some time now it has been known to the Russian Communists. The Reds love to wave this photo, and accuse the Romanovs of supporting Hitler. I never explain anything in red: Communists are enemies, and it is not customary with enemies to enter into polemics, it is a waste of time. But I want to tell you this: I do not see a crime in supporting Hitler in 1926. Then Hitler was not yet like the Chancellor, had not yet started WWII, had not occupied Austria, the Czech Republic and Poland, had not poisoned people with gases and had not burned people in the crematorium. Hitler in 1926 - one of many anti-communist politicians who mimicked as "right." Hitler was a successful populist, and was able to make himself enjoyable for many. In addition, Germany in the 1920s was still influenced by the corps of General von der Goltz, who was commanded by Prince Bermont-Avaloff during the civil war in Ruks. It was a very peculiar Russian-German white monarchical formation, on which Emperor Kirill Vladimirovich relied. In the 1920s, there were many Russian white emigre monarchists in Germany, there were many German monarchists among the military and business people. There was even a great attempt to create a single Russian-German monarchical army that must come to Russia, overthrow the Bolsheviks and return the Emperor Romanoff to Russia and the Emperor Hohenzollern for Germany. Such work was conducted very seriously: rich Russian and German business people created the joint society "Aufbau" to finance the right anti-communist policy. This society included the Duchess Victoria Fedorovna, and Krupp, and the Russian millionaire Gukmasoff, and others. This fund gave money for the right anti-communist work to very many, including a small party of Hitler's national socialists. After the famous "Revolution with Beer" the head of this fund, Mr. Schneiber-Richter (German nobleman of Russian origin) was killed in the street, and the "Aufbau" foundation began to collapse. Gradually by the end of the 1920s, all contacts between Russian emigre monarchists and German right-wing politicians ceased. At the same time, the evil man Alfred Rosenberg was greatly influenced by Hitler. This Alfred Rosenberg was a Russian dame, born in Russia, studied at the Imperial University in St. Petersburg; he was a member of the Bolshevik Party, but in 1919 he left for Germany. This ugly Rosenberg, like all the Bolsheviks, was a big Russophobe; he exerted such influence on Hitler that it was very unpleasant for Russian anti-communists and monarchists in Germany when Hitler became the Chancellor. When Hitler was making war against the USSR, many Russian people thought that this was a liberation from Bolshevism; there were many soldiers, officers and generals in the Red Army who wanted to fight against Stalin and communism. They asked Hitler for help, they wanted to create the Russian Alternative Government and army as allies, and fight against Stalin for the liberation of Russia. But Hitler listened to the rogue Rosenberg, and did not allow such a Russian Alternative Government and the Russian Liberation Army. The result was such that for Hitler it all ended very badly. In general, this Hitler was an ordinary Bolshevik, only a lot of racist. What is "national socialism"? This is also socialism, the left doctrine. This Hitler did not like the Monarchy, he insulted his generals monarchists (Fedor von Bock and others), he deceived Hindenburg. Great Paul Hindenburg made Hitler as Chancellor, and said that after my death this Hitler restored the Wilhelm Monarchy in Germany. This ugly liar Hitler promised that there would be the Emperor Wilhelm and the Monarchy, but he deceived himself and became a dictator himself. In his youth, this Hitler was as a commissar in the Bavarian Red Army; in 1919 this red commissar Adolf Hitler was arrested by the head of the Bavarian police Ernst Rhem (yes, the same one). What can we expect from the Bolshevik, from the Socialist, from the Communist? ... Only lies, only deception, only betrayal, only intrigues against the Crown ... When this Hitler needed money, he deceived both Hindenburg, and the Duchess Victoria Fedorovna, and others . When he became Chancellor, he ordered bad orders against the princes of Germany. Everybody knows about this. Ugly, ugly plebeian left Hitler. Yes, I agree that Hitler was a socialist- but I'm not sure he was a Bolshevik though- because he condemned the Bolshevik regime in "Mein Kamf"- maybe I am wrong about this. Wasn't Rosenberg Jewish? I agree that Hitler betrayed his royal allies the Hohenzollerns and Romanoffs- and used them for money. But the Hohenzollern monarchy was betrayed long before Hitler came to power. None of the Allies ever set foot on German territory in WW1. 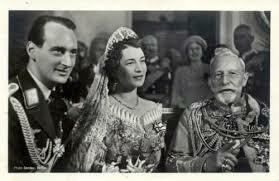 In my opinion there was no need for the kaiser's abdication- nor that of any of the German princes. His cousin Prince Max of Baden, who was Imperial Chancellor in November 1918 announced on 9 November Wilhelm's abdication and that of his son to the German people, but no such abdication had taken place. However, Wilhelm and his son were obliged to leave Germany, and find refuge in the Netherlands. This was a coup d'etat, not a revolution. The kaiser only abdicated formally in writing on 26 November- probably under pressure from the Dutch Government. Like I have said before, the whole reason for WW1 was to topple the Christian imperial monarchies of old Europe, and replace them with Masonic atheist republican regimes. People laugh at my conspiracy theories without considering the the reality that SOME conspiracy theories are actually true. This goal was achieved with ruthless efficiency and terrible suffering and loss of life. If you read the famous "Willy-Nicky" telegrams, it becomes very clear that NEITHER of these two emperors (they were cousins and friends) wanted a war between their empires- the war was imposed upon these rulers by their own generals and their own governments. Proof of this tragic farce was the marriage in 1938 of Prince Louis Ferdinand of Prussia with Grand Duchess Kira Kirillovna of Russia- these dynasties were never enemies, war was imposed upon them- basically to get rid of them. See the photo below. 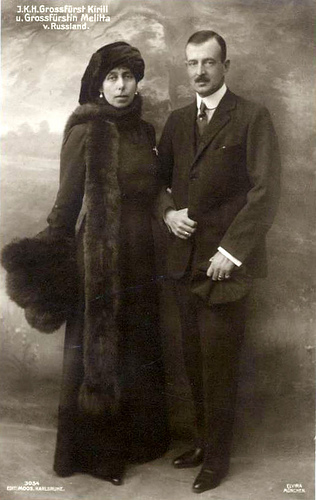 In fact the Kaiser was particularly fond of Kira to the point of infatuation. The photo says it all. See photo below of Emperor Kirill Vladimirovich and Empress Victoria Feodorovna of All the Russias (1924 - 1938). Victoria died in 1936, Kirill died in 1938- Anton Bakov, founder of the Monarchist Party of the Russian Federation claims that Kirill Vladimirovich was killed in 1938. I don't know if this is true. Stalin would certainly have had reason to liquidate him. Way back in February, I said that I would reply to sir_Roman on the question of Nicholas II’s anti-Semitism ‘in the next few days’. If I’d said ‘the next few months’ this reply would still be tardy, but here it is at last. The following quotations are all from The Romanovs by Simon Sebag Montefiore, the first from pp 530-531 of the UK paperback edition, published in 2016. The next quote is from page 543. Stolypin … was preparing for much more liberal reforms that challenged Nicholas’s deepest convictions and he started with Nicholas’s fetish – the Jews. There are many other passages I could lift from to make my point that Nicholas II was at least as anti-Semitic as his father Alexander III and great-grandfather Nicholas I, but I will confine myself to one more quote, from p 634 and confinement with the rest of the Imperial family in Tobolsk, chronicling the former Emperor’s (understandable) outrage at the Bolsheviks making peace with Germany on grotesquely unfavourable terms. This confirmed his belief in an international Hebraic conspiracy. ‘I started to read aloud Nilus’s book on the Anti-Christ to which have been added the Protocols of the Jews and Masons [Protocols of the Elders of Zion] – very timely reading.’ Nicholas was still blaming the evil Jews for his and Russia’s fall: he was reading this venomous anti-Semitic forgery to the family.